MANILA, Philippines – The November 2018 Customs Broker board exam results including the complete list of passers, top 10 examinees, performance of schools, among other important announcements are available at this website as the Professional Regulation Commission (PRC) releases the results online two (2) working days after the last day of board examination. As announced, 1,266 out of 2,478 successfully passed the exams. The November 2018 Licensure Exams for Customs Broker were administered by PRC Board for Customs Brokers headed by its Chairman, Nenette T. Dagondon and its member Rolando L. De Jesus on November 21-22, 2018 at PRC testing centers in Manila, Cebu and Davao. According to the Commission’s Resolution No. 2017-1068 entitled "Schedule of Licensure Examination for Year 2018", the target release date of November 2018 Customs Broker board exam result will be on November 26, 2018 (Monday) or two (2) working days after the board exams. During November 2017 Customs Broker board exams, results were released after three (3) working days. The schedule of online appointment for issuance of Professional ID and Certificate of Registration will be from December 4 to December 5, 2018. Initial registrants are advised to register online via http://online.prc.gov.ph/, an online application and registration portal of PRC. Customs Broker board exam is one of the programs with average number of examinees being administered by the Professional Regulation Commission. In the most recent exams conducted on November 2017, 1,114 out of 2,093 examinees passed. Meanwhile, none among the schools are qualified in the top performing schools list. 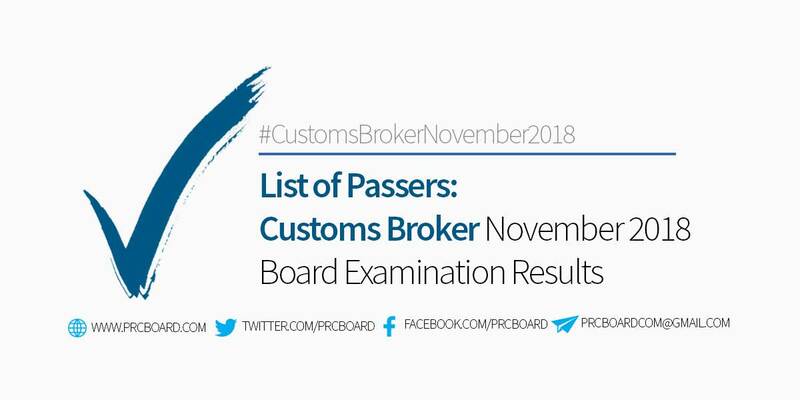 To receive up-to-date news about November 2018 Customs Broker board exam results, we advise our visitors to bookmark this page, visit PRC official website or follow us at our social media pages via Facebook and Twitter.